While I recover from on-going birthday celebrations and bashes, I’ll let my good friend Christina from the blog MeleCotte, entice you with a couple more recipes she’s been playing with out of the numerous cookbooks she’s helping me review. These two following ones are from “Viva Vegan!” by Terry Hope Romero, which I can’t wait to dig into myself. 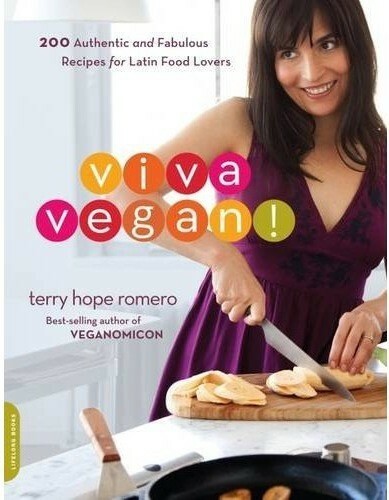 While I’m not a vegetarian or vegan, much like Christina, there is something that piques my interest in a Latin based book that highlights both styles of food. I don’t know 5 Latinos that don’t eat meat! Outside of rice, green vegetables and flan, I can’t remember the last time I deliberately made either type food. So, when I asked her to take a stab at playing around with recipes out of this cookbook, I was excited to see what she’d come up with. The papaya sorbet which we featured here was mouth-watering and something we all love to eat during summer months (right!?). And papaya for us an every day fruit we love to enjoy in a variety of ways. But, when she sent me these new pictures and recipes, I was intrigued. Chimichurri is akin to Mexican (Argentinian and Nicaraguan) cuisine, hence appealing to my palate at any time. Tofu on other hand would require some serious tweaking for me to even come close to tasting. The combination however seems to work well and somehow has me mildly interested in trying for myself. They definitely looked appetizing enough to have at least scanned the ingredient list! If I try it, I’ll let you know! The pickled onions also looked like something I might try. Not because they can be categorized as vegetarian or vega, rather because they’re healthy and can pretty much be a great complement to salads and certain sandwiches. Plus, who doesn’t enjoy pickling?! What a great way to preserve food! Add a bit of jazmine rice on the side and I may just end up with a full dinner meal! Thanks, Chris for making these and sharing how they turned out! Preheat oven to 400◦ F. Slice tofu into eight ½-inch-thick slices and pat dry with a paper towel or clean kitchen towel. In a shallow glass 9X12 baking dish, combine the olive oil and soy sauce. Lay a tofu slice in the baking dish, pressing it into the sauce mixture. Flip and press again to coat with the mixture. Repeat with the remaining slices and bake for 30 minutes, flipping once, until the slices are beginning to brown on the edges. Remove from the oven but don’t turn the oven off. Using a fork, poke holes though the tofu. Then, with a rubber spatula or large spoon, spread about a third of the chimichurri sauce evenly and completely over the tops of the tofu. Flip the slices and spread another third (or slightly more) over the top of the tofu. Bake another 25 minutes, until the tofu if firm and the edges are golden brown. Bake longer if a chewier texture is desired. 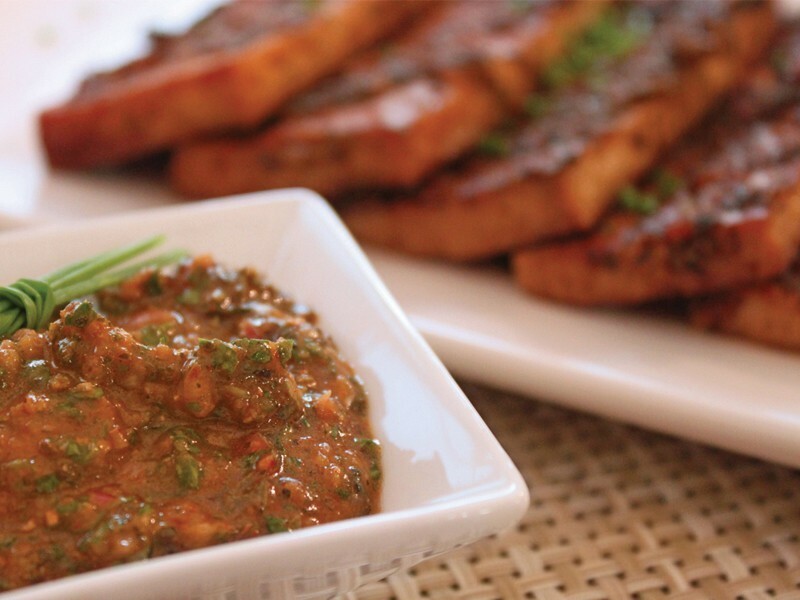 Serve the tofu hot with chimichurri sauce. Serves 4. Puree all ingredients in processor. Transfer to bowl. (Can be made 2 hours ahead. Cover and refrigerate until ready to use.) Makes about 1 ½ cups sauce. In a large pot, bring 2 quarts of water to a rolling boil. Add onions. Stir for about 30 seconds, then drain into a colander and rinse thoroughly with cold water to stop onions from cooking. Shake colander to release excess water. In a 2-quart plastic or glass container, combine drained onions, limes juice, vinegar, salt, and sugar. Toss to mix everything, tightly cover the container and chill for at least 2 hours to allow the flavors to blend. The onions will taste best if allowed to marinate overnight. Keeps for 2 weeks. * ONE COMMENT.ONE EATS. will resume next month. Please consider reading about my hunger campaign here and supporting it by simply leaving a comment on the corresponding post! One comment means one food item for a person in need! Thanks! While I’m the farthest thing from a vegan and tofu doesn’t even rank as food for me, I have to admit I was intrigued by these offering, mostly the onions, for sure. The pics at least make both recipes attractive. Thanks for including these, Bren! David, to be honest, I am not a tofu girl – at ALL. I think its a texture thing. But, the recipes in this book offer seasonings that allow me to get past my mental affliction towards the ingredient. Love the red onions,I will try them…When I see Chimichurri my mind goes to Argentina! I guess the use it in some parts of Mexico too. David: You and me both…I’ll have to make you some of those onions… Very easy, actually. Chris: Thanks for hooking it up! Lola: Yeah, you’re right, Argentina is the real and original place of chimichurri but I’ve always had it with Mexican food, so for me, it’s where I go first! I’ve added Argentina and Nicaragua in parens for those that may look for that information. Thanks for the suggestion. Very interesting the Tofu. I love pickled onions with tomatoes and cucumber, yummy.. 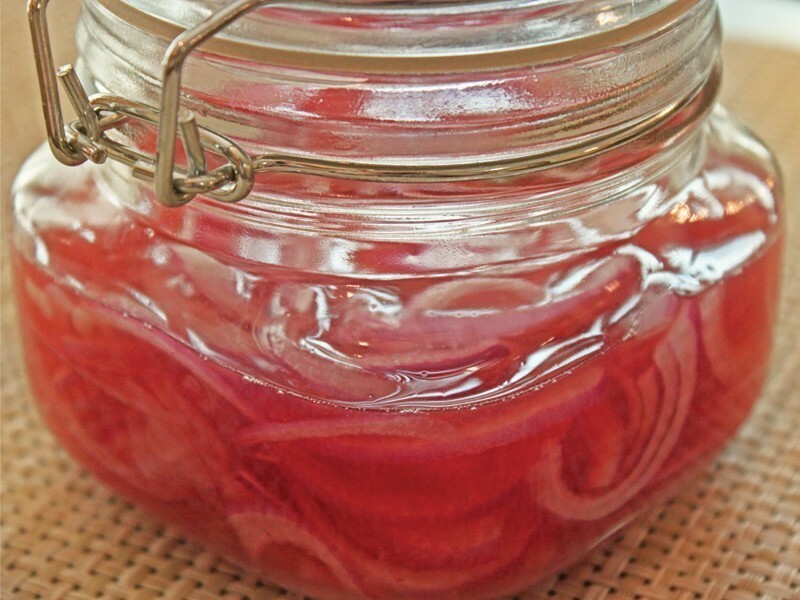 I am not a vegan but I love this Pickled Onions recipe. I will do it this weekend. I think I only had tofu once but these recipes make me want to try it again. Also, the onions look really good. Definitely nothing wrong with a meatless meal(At least that’s what I think). Latin flavors are really the perfect foil for tofu. After all, tofu is one of those food items that sort of takes on the flavors of what you put with it – and Latin flavors are bold, bright and spicy. A match made in heaven. Simone & Denise: I’m going to work a bit more on liking Tofu. It’s just not up my alley! I know our Latin flavors are bold and can pretty much take anything up some notches, but no me entra! Carolina: The pickled onions are good. I’ve not made them according to this recipe, but they do look appetizing… have you tried pickling tomatoes? Dullah: Wow, had no idea you like tofu! I know you like onions, so I’ll have make some for you… think of all the caramelized onions you’ve had in our rice! How did I miss this book? I would have never thought of Latino vegan food but what a great marriage. Will have to check this one out. 8 Days of Eating in Hawai’i. Well, Almost. Chinatown First.